This 15 minute sauce works perfectly on pasta, stirred through hummus, drizzled over salads, as a dip for vegetable crudités, pitta bread and tortilla chips. It’s quick, simple and really versatile. Also, for those of you who eat seafood, my family like to bake cod or sea bass in this sauce and serve with new potatoes and lots of green veg - they really love it, especially during these warmer months. I’ll have to try a “tofush” (tofu + nori sheets) version when I get chance and see how that turns out for the rest of us to enjoy. 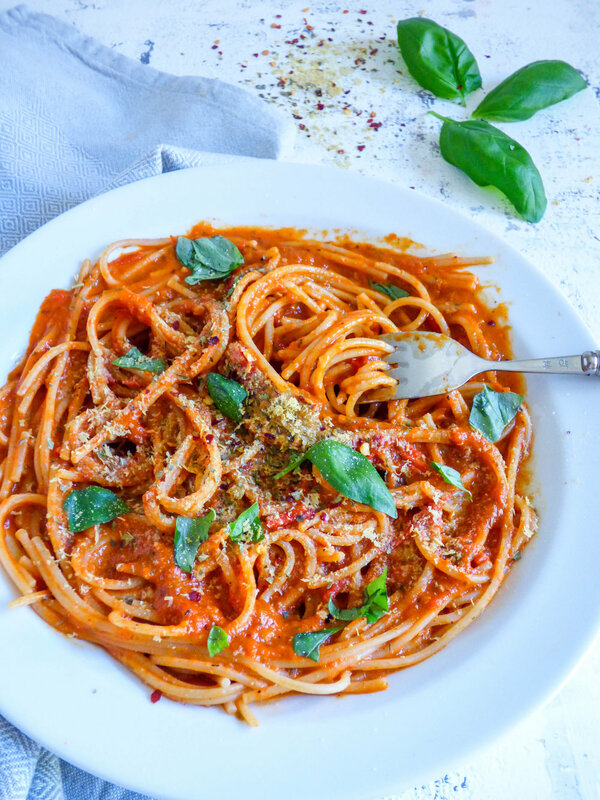 However you choose to eat, regardless of the “label” or your dietary requirements, there’s a way this sauce will work for you, and can provide you with some more quick, nutritious and delicious meal options which is always a good thing. You can also batch cook this, portion it up, and freeze it to have on hand whenever you fancy. 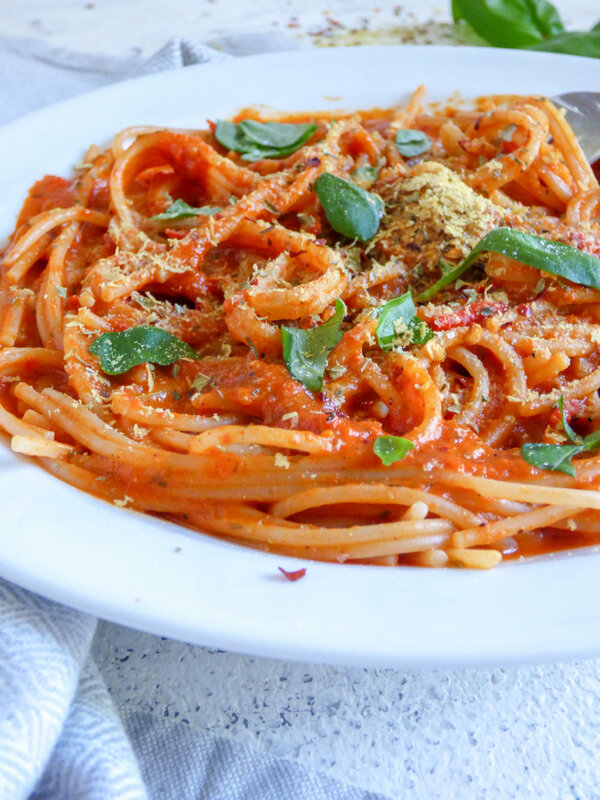 The recipe below makes enough for at least 4 portions of pasta sauce using 100g of pasta/spaghetti per person. It works beautifully with doves farm brown rice spaghetti. You can also add any other vegetables that you love to create your own delicious meal. Add the garlic oil to a large saucepan over a medium heat. Add the spring onions and allow to soften for a few minutes. Next, add the peppers, courgette and tomatoes and sweat out for a few minutes. Stir in the tomato purée, herbs/spices then add the veg stock and milk. Crank up the heat, bring to the boil, then take it back down a little to a medium/high heat and let it bubble away for about 10 - 15 minutes or until about 3/4 of the liquid has reduced. Stir frequently to ensure it doesn’t stick to the bottom of the pan. Blend with a stick blender to your desired consistency or blend completely smooth in a blender (make sure it can handle hot liquid). Pour it back into the pan on a low heat and stir through the nutritional yeast - I use 3 tablespoons. Taste and adjust seasoning if necessary. Note: If you’re making spaghetti, add the cooked spaghetti to the sauce, stir until is all lovely and coated. Plate up, then sprinkle over some more nutritional yeast or vegan/vegetarian Parmesan style cheese.